Changed traffic conditions have been implemented during construction. Ample car parking is still available. Major improvement works are underway at Albury's popular Noreuil Park Foreshore. Stage 1 works have been completed and stage 2 works commenced in March. 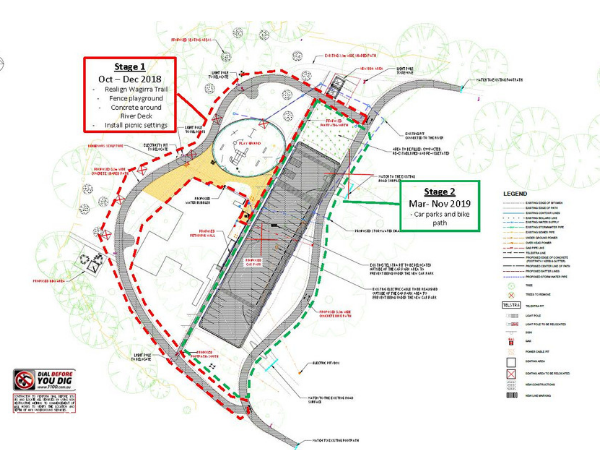 As stage two involves upgrade of the car park conditions in the park will change for the duration of the works. The retaining wall at the rear of the building is complete with the concrete steps and pathway continuing. The carpark construction work is scheduled to commence in June. Turf has been laid on the river side of the Mitta Mitta Canoe Club after the completion of the drainage works. Works continued on the retaining wall with the main focus on the southern end. pathway and steps preparation has commenced. The plane tree was also removed last week. The construction of the retaining wall brick continued this week with the laying of the red brick outer wall. works will continue on the wall next week. The drainage at the front of the Mitta Mitta Canoe Club was also completed this week. The area was top dressed at the conclusion of the works. The initial retaining wall block work has been installed this week with the face brickwork to commence next week. The installation of a gravel path adjacent to the carpark has commenced this week. This will provided improved access for park visitors from the carpark to the Riverdeck Cafe and playground area. The retaining wall construction commenced this week with the footings installed and bricks delivered to site. Stage 2 works has commenced with a temporary access road installed this week and temporary fencing erected in readiness for the retaining wall construction. Installation of two new play elements for were complete this week. In addition some preparation works for stage 2 was carried out (relocation of some electrical infrastructure). Three bespoke bike racks have been installed this week. For those who don't know how to use them, back wheel of the bike goes against the fence and hang the seat on the rail. The drinking fountain and bottle filling station was installed this week. The playground area is now open with the completion of the fencing. Other works this week included planting of five Chinese Elms, completion of the irrigation system and laying of turf. More turf is ordered for next week. Additional play equipment, drinking fountain and bike racks will now be installed early in the new year. Noreuil Park works continue this week with completion of all concrete works in this stage, alterations to the irrigation system, levelling around the worksite and additional tree planting. Turf is on order and will be laid next week. Playground is still closed with the fencing scheduled to be completed next week. The River Deck Cafe re-opens on Saturday 17 November while the playground area is still closed due to the construction works. The centre grassed area is now open for the summer parking while there are changes to the parking adjacent to the Cafe. Pedestrian access is now available on the foreshore area, however there are still active construction zones. Works continues in front of the River Deck Cafe and realignment and widening of the Wagirra Trail this week. The Cafe will reopen on 17 November. Concrete pads have been installed for the picnic tables and works have commenced on realigning and widening the Wagirra Trail.